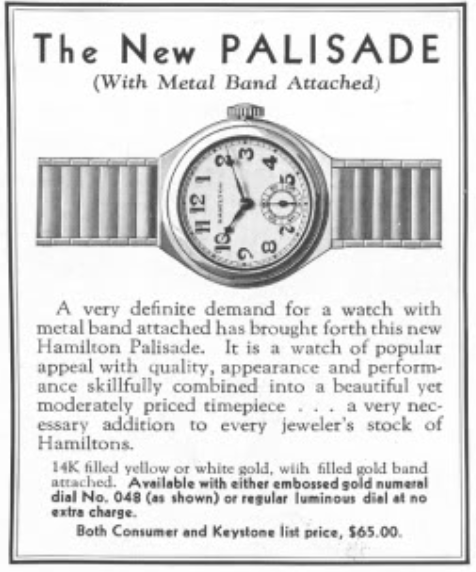 Hamilton's first use of a metal bracelet was in 1931 with a model called the Palisade. It was only produced for a single year. The bracelet is more like a strap as it has a clasp to join the two ends, as opposed to an expansion design that was more popular in the 1950's. Examples of the bracelet that I have seen were made by Hadley as well as Kreisler. The bracelet was specially made to accommodate the lug design. The Palisade came in a white or yellow gold filled case. In addition, you could choose from a luminous dial or a dial with embossed gold numbers with black hands. The luminous dial is the same pattern used in the Cushion B from the same period. The Palisade is unique in that it has a 12mm lug spacing so it takes a very narrow strap - way narrower than what any man would be familiar with. Tucked inside the Palisade you will find a 17 jewel 6/0 sized 987F movement. The 987F is identical to the original 987 from 1927 except the jewel chatons (settings) are pressed in place with friction rather than held in place with screws. I recently received a Palisade project watch in need of attention. From the outside it looks pretty good. The glass crystal is scratch-free and the luminous dial and hands had been professionally redone in the past. The only thing that is really out of place is the crown. It is a replacement and is a bit too small. The Palisade has a three-piece case and the movement is held in place in the center section by two case screws. The case back and front bezel snap on and off. The gold filled case back is clearly marked as a Hamilton model. This watch has an interesting movement installed... it's an early 987A movement from 1937. It's obviously a replacement movement. Although the 987A is the same physical size as the earlier 987 movements and it shares many of the same parts... only the first year 987A movements had the case screw holes on the barrel bridge and the train bridge. Although this movement is running, it's running very poorly - in fact, it doesn't even register on my timer other than "noise". A closer look at the balance showed that it's an older compensation balance, and not a 987A bimetallic balance at all - so this movement is really an oddball. Fortunately I have a spare 987F movement with a serial number from 1931 so it's a perfect drop-in solution to replace the incorrect 987A. Unfortunately, the case has been modified by someone in the past and the case tube for the stem has been removed. Apparently sometimes people remove the stem tube to accommodate a replacement crown that doesn't fit over the tube. That's an unfortunate short-cut - as it's easier to find a correct replacement crown than to repair a damaged case. Without the stem tube, there's a greater likelihood of water getting into the case. My replacement movement is running just fine and ready to be installed. I like to leave them running a little fast as they slow down slightly as the mainspring unwinds. I installed a more appropriate crown to go with the replacement 987F. I also happened to have a vintage 12mm strap to install on the watch. A lot of guys will slightly trim a 14mm strap for their Palisade as 14mm is noticeably wider than 12mm when worn on the wrist. Here's an example of a Palisade I restored a while back with the embossed gold numeral dial... you can see the dial is very similar in design but the figures are gold gilt.